This document is a technical summary of the unpublished Federal Highway Administration (FHWA) report, Splash and Spray Assessment Tool Development Program (FHWA Contract No. DTFH61-08-C-00030), available through the VTechWorks the Virginia Tech institutional repository, managed by the University Libraries, https://vtechworks.lib.vt.edu/handle/10919/50550. This TechBrief describes the development of an assessment tool to characterize the propensity of highway sections to generate splash and spray during rainfall and the impact of splash and spray on road users. The effects of vehicle splash and spray are well known to motorists who have driven in wet weather conditions. Research suggests that splash and spray contribute to a small but measureable portion of road traffic accidents and are sources of considerable nuisance to motorists. Furthermore, splash and spray from highway pavements can also carry a number of pollutants and contaminants. When deposited, these contaminants can be detrimental to plant life and accelerate the corrosion of roadway appurtenances. Splash and spray are individually definable processes that are the products of a number of different factors. Many parties have gone to great lengths to reduce the splash and spray created by motor vehicles (especially heavy vehicles) by retrofitting devices that alter the vehicle's aerodynamics. Another possible solution to the problem is to change the characteristics of the highway pavement, such as pavement geometry, drainage, texture, and porosity. The development of the assessment tool included a combination of laboratory and field experiments, theoretical developments, and computer simulations. The project started with an evaluation of prior work in the area of splash and spray mechanisms. This evaluation showed that (1) the main factors affecting splash and spray are water film thickness, vehicle speed, tire geometry, tire tread depth, vehicle aerodynamics, and vehicle spray suppression devices and (2) none of the techniques that have been used to measure splash and spray are widely accepted and readily available for routine pavement surface evaluations. The literature also suggested that there are four prevailing splash and spray mechanisms: bow wave, side wave, tread pickup, and capillary adhesion. The work then continued with the development of the three submodules that comprise the splash and spray assessment tool: (1) a water film thickness model, (2) an exposure model for estimating the amount of water that will be projected by the tire, and (3) a splash and spray model that predicts the likelihood of splash and spray occurrence based on the other two models. The water film thickness model predicts water film thickness on pavement surfaces based on pavement surface properties and rain intensity and is based on laboratory experiments. An indepth analysis of previous water film thickness models allowed the development of a generic formula to compute the water film thickness as a function. Relevant parameters and values for the constants in the formula were determined using the results from flume experiments. Rainfall data available nationwide from the National Climatic Data Center were processed to create an inventory of the expected percentage of time that the precipitation intensity would exceed various precipitation levels. Estimates for areas with weather stations were determined using a geographic information system-based spatial interpolation process. This inventory was incorporated into the exposure model. The exposure model estimates the amount of water that will be projected by the tire given the water film thickness, pavement characteristics, and vehicle speed. The four prevailing splash and spray mechanisms-bow wave, side wave, tread pickup, and capillary adhesion-for different vehicle speeds and water film thicknesses were modeled using a computational fluid dynamic (CFD) model of splash and spray generation. This was done by simulating in a virtual wind tunnel the most critical maneuvers and vehicle combinations identified in field experiments. For example, figure 1 compares the trajectories of the water droplets for two truck speeds. Figure 1. Examples of CFD simulations. The splash and spray model predicts the likelihood of splash and spray occurrence based on the other two models. 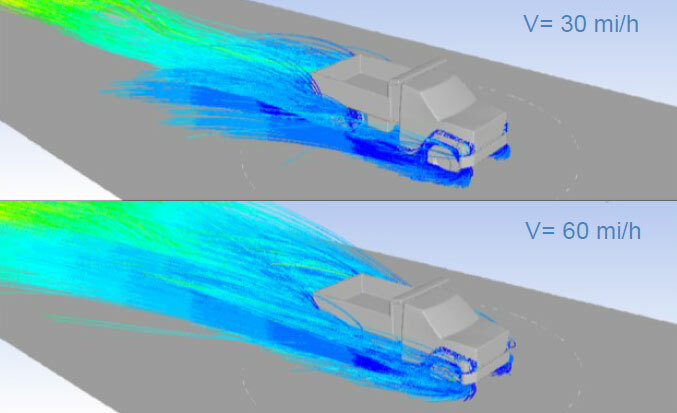 The outcomes of the various simulation runs were synthesized in a set of simple equations that model the mechanisms and combine them into a simple equation to model pavement splash and spray. Field tests conducted under controlled precipitation conditions for assessing the impact of splash and spray on road users allowed for the definition of a new measure of splash and spray: the occlusion factor. 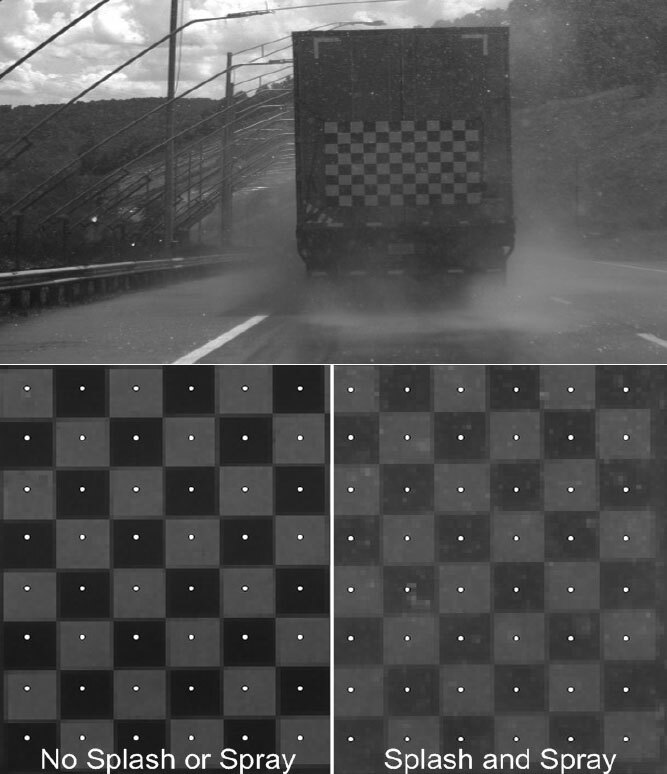 The occlusion factor was defined as the ratio of the mean luminance of the black squares to the mean luminance of the white squares on a large checkerboard placed on the splash- and spray-generating vehicle as captured by a camera placed on the following vehicle and pointed toward the board (figure 2). Figure 2. Occlusion factor definition. A statistical analysis of the collected data showed that the occlusion factor correlated well with the five subjective user perception variables studied (obstruction, concentration, risk, confidence, and control) and thus can be used as a measure of the nuisance produced by splash and spray. Finally, the models were implemented in simple prototype tools and validated through field experiments and pilot applications using existing data. These pilot applications showed that the developed splash and spray assessment model was practical and could be used to support highway engineers' decisions regarding highway design and maintenance. Compute the water film thickness based on the rainfall intensity and pavement surface properties. Compute the maximum amount of water available for splash and spray. Compute the contribution of each splash and spray mechanism until the total amount of available water is exhausted. Compute the spray density corresponding to each mechanism based on the corresponding mass flow and the speed of the vehicle. Compute the total spray density. Covert the spray density level to a subjective nuisance index (figure 3). Figure 3. Example of splash and spray density estimation for a road segment. This model can provide useful information for supporting highway design and maintenance business processes. Investigate whether there are texture parameters that should be taken into account when calculating water depth. Investigate the impact of missing hours of precipitation recordings on the accuracy of the predictions. Conduct additional verification of the mechanism modeled using CFD and take into consideration the distribution of water droplet size and longer experimental road segments. Turner-Fairbank Highway Research Center, Office of Infrastructure Research and Development, 6300 Georgetown Pike, McLean, VA 22101-2296. Researchers-This study was performed by the Center for Sustainable Transportation Infrastructure of the Virginia Tech Transportation Institute, Transport Research Laboratory, Applied Pavement Technologies, and the Virginia Center for Transportation Innovation and Research. Distribution-This TechBrief is being distributed according to a standard distribution. Direct distribution is being made to the Divisions and Resource Center. Availability-This TechBrief may be obtained from the FHWA Product Distribution Center by e-mail to report.center@dot.gov, fax to (814) 239-2156, phone to (814) 239-1160, or online at https://www.fhwa.dot.gov/research. Key Words-Splash and spray, water film depth, pavement macrotexture, computational fluid dynamics (CFD), occlusion factor, user nuisance. Notice-This document is disseminated under the sponsorship of the U.S. Department of Transportation in the interest of information exchange. The U.S. Government assumes no liability for the use of the information contained in this document. The U.S. Government does not endorse products or manufacturers. Trademarks or manufacturers' names appear in this TechBrief only because they are considered essential to the objective of the document. Quality Assurance Statement-The Federal Highway Administration provides high-quality information to serve Government, industry, and the public in a manner that promotes public understanding. Standards and policies are used to ensure and maximize the quality, objectivity, utility, and integrity of its information. FHWA periodically reviews quality issues and adjusts its programs and processes to ensure continuous quality improvement.